it’s almost my favorite day of the year! the day after thanksgiving when they play christmas music on the radio | you seem nice. i just got back from the nutcracker ballet final dress rehearsal. that’s not a mouthful. it was super coool! my grandma thought the angels depicted on the backdrop were monkeys. i think she got it mixed it up with the wizard of oz. or not? i don’t really know. this is the same woman who thought being offered the option of a mexican coke was slang for cocaine. yes, we were at a restaurant. how’d you know? anywho, i’m gonna preempt this next part with a NERD ALERT: i was more focused on the orchestra than the dansuhz (dancers) because it took me back to 4th and 5th grade when i was in band and played the clarinet! and i got really uncomfortable when the lead/1st chair clarinetist messed up. like physically squirmish. i felt bad, but i don’t think anyone noticed, so that was good. AND on monday we had a family outing to the eye doctor for our annual eye exams. the nerd alert still pertains to this. it wasn’t as ridiculous as you would think it should have been. and my eyes improved! i don’t understand it. i mean, i still need glasses, but .25 less for both eyes than before. so this got me thinking…dangerous, i know…since one eye is worse than the other and if i’m still on this path of improving vision, at some point i’d only need glasses for one eye…some of you may know where this is headed…then that would mean i would get to have a monocle! 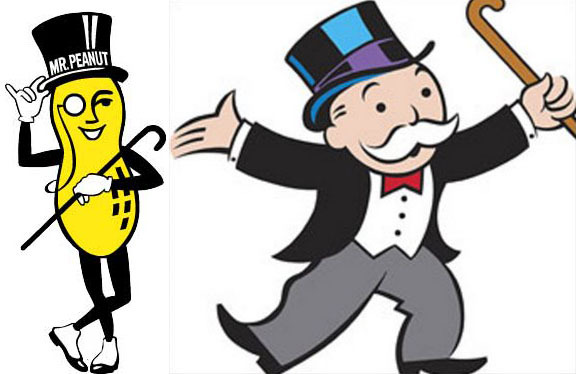 too bad i just looked up BOTH of them and mr. peanut lacks a mustache and monopoly man lacks a monocle. dub tee aych. i guess i would just be an alyssa wearing a monocle, top hat, and mustache while carrying her cane. they’re called dreams for a reason. the words disappointment and failure come to mind. now, here we are on the eve of giving thanks. kinda crazy how time is seriously whizzing by. so i’ve decided to list a few things i’m thankful for! hopefully it won’t come off as super cheezy. like cheese assortment at a holiday party cheezy. none of that. — rue magazine. i kinda just happened upon it somewhere in the twittersphere and have been a MAJOR fan ever since. i felt like rachel zoe just then. it’s seriously ba-na-nas. i die! who’s rachel zoe!?! shut your face! ok, that may or may not have been a bit of an overreaction…sorry. and if you don’t want to watch the whole video, then fast forward to 1:34 to get a good sense of who rachel zoe is…she’s a stylist and my fave. ANYWAY, rue magazine is dedicated to interior design and party hosting. basically amazing and secret/not so secret hobbies of mine. — books. seriously. you can learn a lot from them. i know, i’m a little late on this one. AND come to find out that the index of a book is like pressing control-F/command-F in a book. it tells you where you can find the shiz you’re lookin for. it’s like the dewey decimal of search engines within books. but hey, it works! — and most importantly, YOU! and i know sometimes when i read stuff on facebook and someone’s like “i’m talkin to you, yes you!” i always wonder if they really do mean that because what if we’re not that great of friends ya know? well in this case, i’m assuming i know you. and if i know you i must like you. and even if i don’t know you. whatevs. thanks for continuing to read for this long! — 8th week of christmas. it’s a good one, too. so everyone take a deep breath, the insanity has been put on pause. push play when you return to your respective college cities.